In today’s digital world, every business needs to maintain at least a somewhat consistent Internet presence. Even if a company doesn’t have a social media management team, they could still coast by on something like an automated Twitter service. Having a Twitter bot run an organization’s account at least part of the time is a great time and money saver. But what is a Twitter bot, really? Well, Twitter bots are actually incredibly simple computer programs that run social media accounts. In fact, about 5-10% of all Twitter accounts are actually bots – and most people can’t even tell them apart from humans! That is why there’s been some concern about fake followers and bots influencing public discourse. But, not all bots are bad. In fact, there are some very useful Twitter bots, like the ones that tweet about weather or traffic conditions. Furthermore, many businesses have automated Twitter accounts to inform and interact with their customers. Some bots exclusively repeat dialogue that’s programmed into them, while others can make simple mix-and-match sentences. Then there’s also the way that they amplify real humans’ tweets by retweeting, liking and favoriting them. However, with automated Twitter bot services, a business wouldn’t be signing up for amplifier bots. So, there’s no need to worry about fake followers, for the most part. Instead, most automated Twitter bot services will simply have a bot run their client’s company Twitter account. That leaves business owners free to spend their time more productively. In this article, we’ll delve into the world of automated social media accounts to give you the top 10 best Twitter bot services for businesses. So, let’s see what each of them has to offer. In our opinion, the best Twitter bot is Jarvee. It is reasonably priced and will help you manage Twitter and other social media accounts with ease. 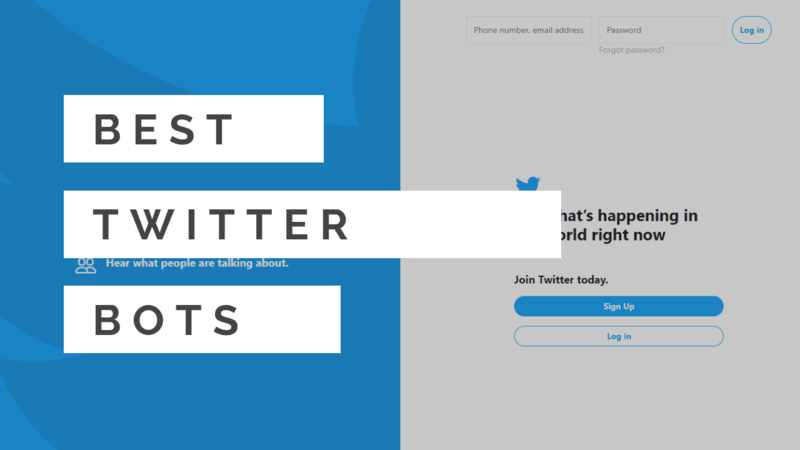 So, What’s the best bot for Twitter automation? When looking for a good Twitter bot for a company, we need to consider the company’s needs. So, we’ll need to ask ourselves how much time we can devote to our social media. That will help us decide whether we want a true bot to completely take over our accounts or simply a social media analytics and managing service. If we’re looking for a service for a bigger company with an established social media department, for example, we might consider getting a service with more listening and analytics features, rather than simple post automation. We may also consider services that support more than one account, on more than one social media site. Naturally, the price and the appearance (or user interface) of the software should be considered as well. So, let’s see what the best Twitter bot service on our list can do for a company’s social media presence. Jarvee is by far the best Twitter bot service we’ve found while scouring the Internet for the best Twitter bots, so we might as well start this list off with it. Amazingly, it offers automated social media services to many social media sites. Jarvee bots direct traffic from social media accounts to a business’s website, or wherever a client wants them to. In addition, it won’t leave the bot’s IP address footprint on the client’s social media account. Many people let their bots post with annoying frequency. However, Jarvee can curb those tendencies by scheduling posts at ideal times for audience engagement. This Twitter bot will even avoid posting at night. On Twitter, Jarvee can automatically follow users who are interested in the content their client offers. Also, it can automatically unfollow users in order to optimize an account’s following-follower ratio. Jarvee can even retweet content that concerns the topics the client specifies. Naturally, it will also allow clients to monitor its results and see their following growing. This service can also directly and personally engage with the client’s social media followers via direct messages, and it can use predetermined replies when followers engage first. All of these features are available for as low as $20 per month, and potential customers can try them via a 5-day free trial. 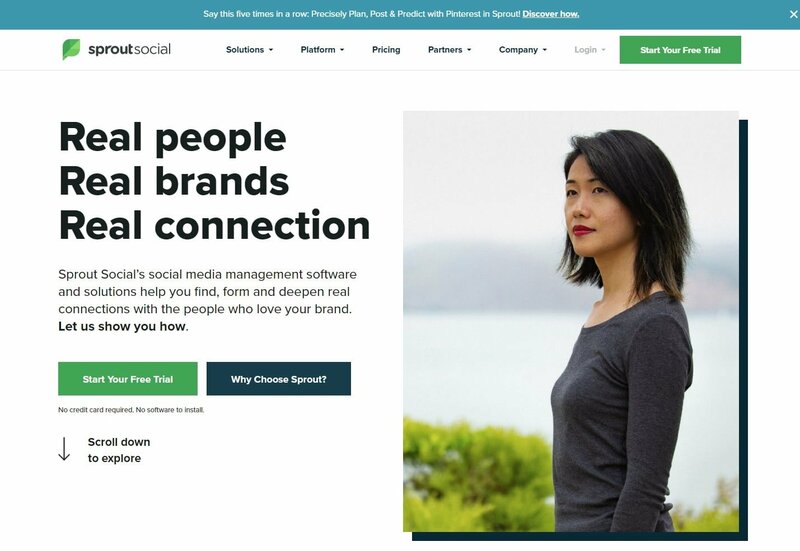 Sproutsocial is a bot service with its own analytics and listening tools that uncover trends that their clients could use when they plan their social media posts. Still, those listening and influencer identification tools could use some work, according to users. Fortunately, Sproutsocial is ever-evolving and working on new features. That is most evidenced in the Smart Inbox tool that allows clients to view all of their social media engagement in one place. That has been a big selling point for this company’s services. However, some more advanced features, such as analytics or influencer lists, are only included in the Corporate and Enterprise plans, which are pretty expensive. Clients may try out the service using a 30-day free trial of any of their 3 plans. The Premium plan costs $99 per month – which is costly, but not as expensive as their Enterprise tier, which costs $249 per month. Advanced features like reports are only available at the Enterprise tier. Listening and influencer identification tools could be better. Hootsuite is one of the most famous names in social media management and automation. It has many of the features that are of great importance to businesses, including listening and publishing features. However, some of them aren’t as refined as those that other services offer. Still, Hootsuite comes with all of the standard features in an easy-to-use interface. It has four payment plans. Users can try out the less expensive plans for 30 days before deciding if they want to pay the monthly fees ($19 and $99). The more expensive plans are the Business one, which costs $599, and the Enterprise plan – which is fully customizable and therefore not priced on their site. Many management and analytics tools. Most add-ons reserved for top-tier plans. Needs work on publishing features. Social10x is actually less of a Twitter bot and more of a Twitter growth service. It offers several tiers depending on how many followers a client wants. The 500-follower tier costs $6, and the service promises to deliver in up to 2 days. Higher-tier plans will get an account 1000 followers for $9, 2500 for $19, and 5000 followers for $29. Social10x delivers all these followers within 2 days, so no matter how many followers a business needs, they’ll have them within that time frame. While this service isn’t an automatic bot service, they do use marketing and promotional techniques to boost an account’s following. Since these are real followers, they may unfollow the client’s account at some time. Or, Twitter might even delete them, if they’re inactive for a while. However, this service promises to over-compensate the original order to make sure that they deliver the followers the client requested. A smaller business would especially benefit from a service like this one since hardly anyone wants to follow a company account with a small following. Furthermore, some people still balk at the concept of buying followers, likes, and retweets or having fake accounts following them. Works on various social media sites. They use marketing techniques to get followers. New followers are real accounts, with profiles, likes, and posts. Not actually an automated bot service, but a way to buy followers. Many people don’t like following accounts with fake followers. After signing up for Twesocial, a client is assigned to a case manager. The manager will be the only person they talk to in the course of their collaboration with this Twitter bot company. The manager will create and implement a social media marketing strategy that will steadily grow an account’s following. There are also some added features in Twesocial’s service. A business could request to have certain usernames and hashtags targeted with their account. That would mean that the Twitter bot would occasionally mention and/or retweet content surrounding that subject. The Twitter bot could also be set to target a certain gender or followers in a specific location. What’s more, the bot can even avoid mentioning certain subjects and blacklist users. This service can cost between $15-$25 per week. Targets usernames, hashtags, or a certain gender. Tweet Full’s services are fairly basic – it allows clients to schedule automatic liking and retweeting of posts on certain subjects. They can also automatically follow people in order to find potential clients. The service will use hashtags the client provides in order to ensure a following growth and boost engagement. We don’t have much to say about Tweet Full, other than that it’s a good, reliable and safe service – if a bit standard. The service plans are very well defined, so the client will know exactly what they’re getting with each one. The first tier is only $15 per month, and although it can only manage one account, it guarantees 500-600 new monthly followers. For comparison, the top tier is $100 per month, and it guarantees up to 6000 new followers in a month. They even offer a 2-week free trial and clients may cancel at any time, or even get a refund. Removes footprints – unfollows auto-followed accounts, etc. Pretty affordable, even at the Authority tier. Many social media sites now discourage or even delete bot accounts because some simpler bots can seem like spam and generally annoy the users. Because of that, Tweet Attacks Pro offers their unique automation services and analytics while trying to seem as human as possible. This service does all of the standard things a bot does, but it tries not to stick to a pattern. Sometimes, it randomly unfollows someone or does things specifically to make it seem as though it’s a human running the account. However, the complicated user interface leaves much to be desired, and the full extent of the services Tweet Attacks Pro can offer is only available to the high-tier clients. The cost of their one account Pro-tier service is $77, which is already pretty steep, and the full Elite service can cost as much as $399. Full automation of all services is only offered in the Unlimited Elite Version. Manage Flitter allows its users to have an automated Twitter bot service while still staying in charge of their social media presence. So, it would actually be more appropriate to call this service a social media management tool. This platform allows users to personally handle their accounts, check analytics and promote engagement. It also allows customers to schedule their posts to be released at the best time for user participation, among other things. For the undecided, the company offers a free service with limited features, but they also offer a Pro-tier plan at $12 per month and a Business plan for $49. If you’re wondering if this tier will really help your business, you may request a 14-day trial. Mastering this software in two weeks shouldn’t be all that difficult, as it’s very user-friendly. Not really a bot, so users can’t just “set it and forget it”. Agora Pulse offers a fairly similar service to Manage Flitter – it will also leave a lot of the decisions up to the user. Their clients will mostly want to focus on their listening and reporting features, as those show how companies should engage with their customers and followers on social media. Basically, Agora Pulse has many of the same features the service above offers, in a similarly attractive user interface. It even offers free 2-week trials for all 4 of their tiers. The small one starts at $39 per month, while the biggest plan, meant for large companies, is $239 per month. So, choosing between this service and Manage Flitter will be a matter of personal preference. Many options for social media management. As you can see, we’ve decided to close this list off with another service that could be more accurately considered a social media manager. SocialOomph may not look as elegant as the previous two services, but it does offer pretty much the same features. They also offer a free 7-day trial of their Professional plan, which usually requires users to pay $17.97 every two weeks. However, anyone can register and use their basic features for free. Standard social media updates feature. They offer many features for free. After reviewing all of these various Twitter automation services, we can see that each one of them can be useful to a business in different ways. Twitter itself is a very particular social media site, so it does require a very special bot service. In our opinion, Jarvee stands out as the perfect example of everything that a Twitter bot service should be. It supports multiple social media sites and accounts, schedules posts but not too frequently, and personally engages the followers. So, we recommend Jarvee to anyone who needs a social media manager, and especially business owners.